https://i2.wp.com/www.mushroomdiary.co.uk/wp-content/uploads/2018/06/Dryads-Saddle-on-tree-stump.jpg?fit=1230%2C551&ssl=1 551 1230 J C Harris https://www.mushroomdiary.co.uk/wp-content/uploads/2015/10/mushroomdiary-logo-2015-small.png J C Harris2018-06-12 13:11:202018-06-22 09:33:19A good year for Dryads Saddle - Best Bracket Fungus? Walking along a woodland path, the adjacent foliage was heavily overgrown. But something still caught the corner of my eye at the base of a large oak tree. At first, I thought people had left some rubbish, considering the size, but as I removed the overgrowth (receiving many lovely nettle stings!) the picture became clearer. This was indeed a Giant Polypore (Meripilus giganteus or Polyporus giganteus) occupying a good half of the tree’s circumference. Older parts on one side and younger ‘new’ born’ specimens emerging on the other. A common mistake would be to confuse this bracket fungus with Hen of the Woods (Grifola frondosa) but on comparing notes, you’ll realise that these things are just too damn big! And the ones featured here will grow bigger still. The fruiting bodies of this Polypore branch out in clumps. Each clump shares the same short and chunky stem, at the end of which are numerous fan-shaped caps ranging in size from 40 – 90cm in diametre, but are relatively thin compared to this width. They’re quite tough (but flexible) to prize away from the central stem, so a good sharp knife is in order! Apart from their large size, the caps have reliable and distinctive markings. Their light brown ‘overall’ colour (which darkens with age) display several concentric, light/dark zones. On closer inspection you’ll see a layer of very fine brown scales. The edges are fanned or rosette-like and slightly grooved. 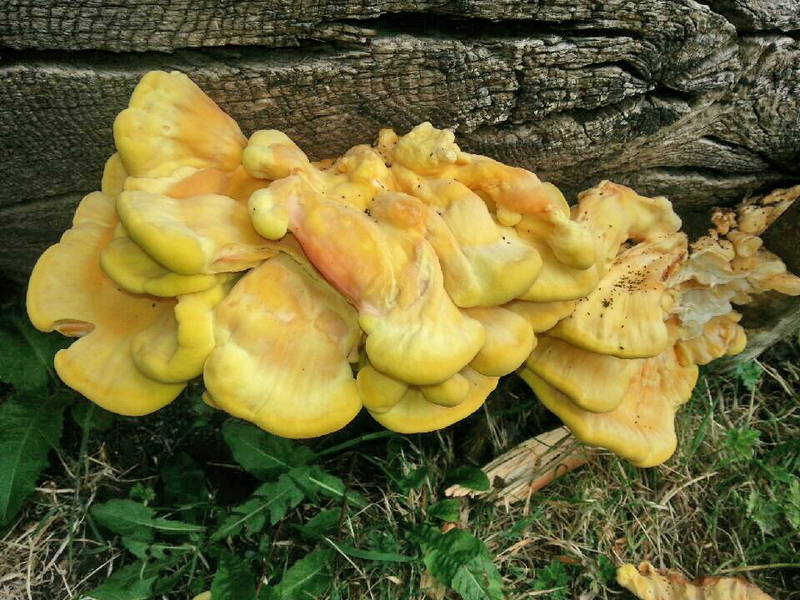 The Giant Polypore might not be as tasty as Chicken of the Woods but it is edible. It does smell quite nice but can taste quite bitter. But just like the Beefsteak Fungus, there maybe be a cooking preparation method to make this taste alot better. I haven’t tried myself, but it’s worth a go I think. Keep a look out for these beauties this autumn. They can be found at the base of (mainly) beech or oak trees (or nearby, emerging from the underground roots) and sometimes on stumps. If you do take some samples you’ll notice after time the pores on the underside turn blackish where touched or bruised. 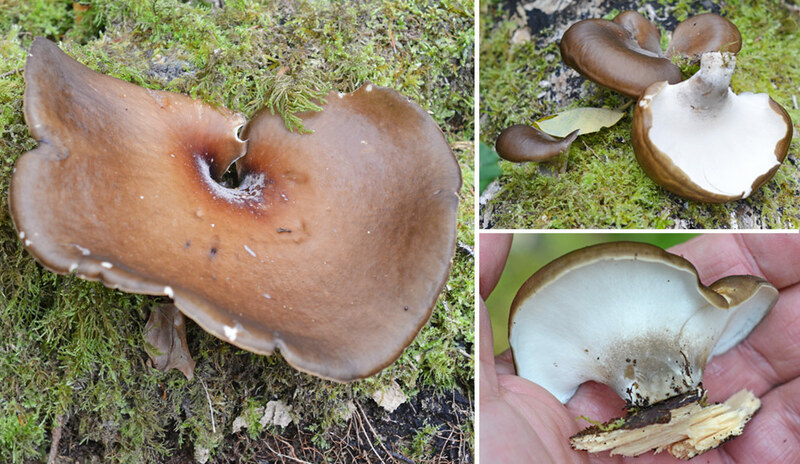 Although unsightly, I don’t believe this affects the final taste, if prepared like the Fistulina hepatica for example. 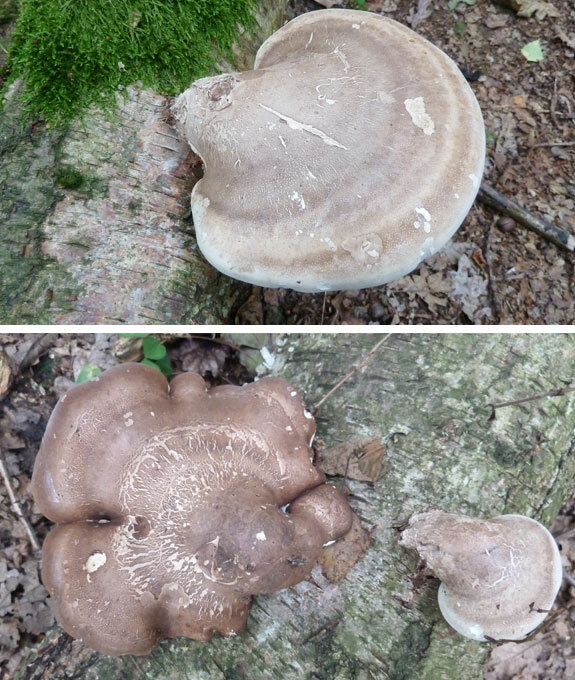 The Giant Polypore – Older specimens appear darker brown (top) while younger ones are a lighter shade (bottom). Note the pure white pores underneath (middle) showing a much younger specimen on the right. 50-80cm across. Made up of rosette formations with short stems fusing at a common base. Each of the fan shaped caps range from 10-30cm across / 1-2cm thick. Upper surface concentrically zoned light and darker brown. Covered in fine brown scales; radially grooved. Flesh is white, soft and fibrous. Late in forming; 3-4mm, sub circular shape. White(ish) bruising blackish. At the base of deciduous trees or stumps; mainly beech or oak. Can grow from roots of tree away from trunk appearing indepent of tree. It’s a comical sight and nice surprise when you first come across an oak tree sticking it’s pinky red tongue out at you! It’s happened to me a few times and I seem to be getting use to it. 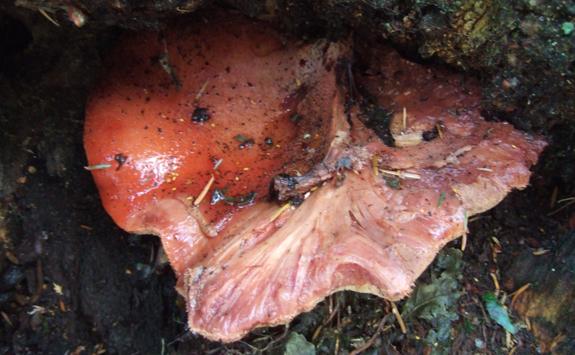 This is the common Beef Steak Fungus (Fistulina hepatica) found during late summer and autumn. It’s a parasitic species usually found at the base of oak trees and sometimes horse chestnut. It definitely looks freaky when younger, it’s fleshy protrusion almost exactly mimicking the tongue of an Ox! The colour initially is pinkish then getting redder and finally brown with age. You must get touchy-feely with a younger specimen because it has a spooky ‘flesh’ like feel, maybe even a little rubbery. The surface even has the warty tongue taste buds on! 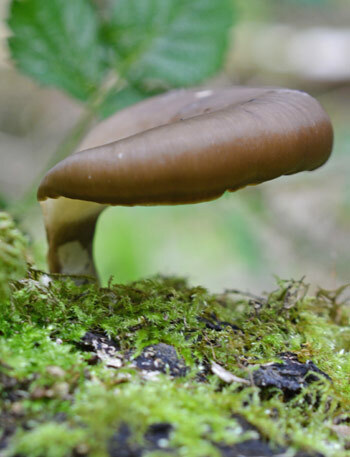 The pale yellow pores on the underside which age red-brown sometimes leak a blood-red juice. This also adds to the overall wierdness of this critter. Marvellous stuff. The common ‘Beef Steak’ definition naturally refers to the flesh which resembles raw steak. And I know what your asking, and the answer is no! It doesn’t taste like beef steak. It is edible though but can be quite bitter (younger ones more so). You can simmer it or soak it in milk for a day to help reduce this bitterness. I intend to try it very soon and will hopefully mention in a later post. There is no worry in identification. There’s nothing out there that even gets close to resembling our ‘beefy’! 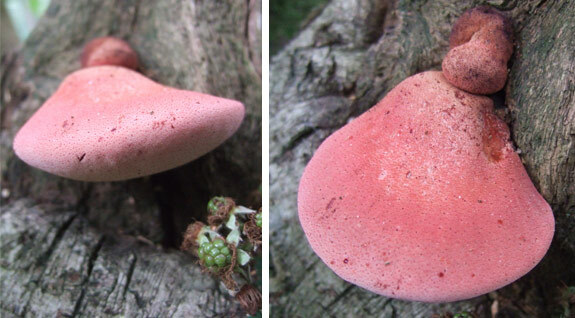 A young example of a Beef Steak Fungus resembling a pink-red tongue! One last snippet of trivia for you – this fungus can cause ‘brown rot’ in the infected tree, which in turn makes for a very sought after kind of timber. In the furniture industry it is named ‘brown oak’ and is in much demand. It is richer brown in colour to normal uninfected oak. Sometimes only slightly infected trees can create a ‘striped’ pattern in the wood – a mixture of light and dark. The photos shown above are of a young individual. All the other shots I have of previous encounters have been munched to pieces by the local, and very hungry insect mobs. The older the fungus gets, the tougher the consistency. Colour also changes from an orange-red through to a purple-brown. As the Red flesh of the Beef Steak Fungus grows older it will be deeper red in colour and may lose some of it’s surface texture due to weather and insect/animal interference.